A touching story about Japanese American children who corresponded with their beloved librarian while they were imprisoned in World War II internment camps. When Executive Order 9066 is enacted after the attack at Pearl Harbor, children's librarian Clara Breed's young Japanese American patrons are to be sent to prison camp. Before they are moved, Breed asks the children to write her letters and gives them books to take with them. Through the three years of their internment, the children correspond with Miss Breed, sharing their stories, providing feedback on books, and creating a record of their experiences. 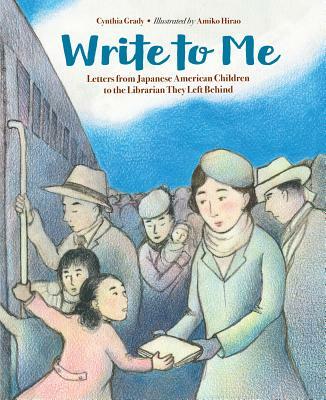 Using excerpts from children's letters held at the Japanese American National Museum, author Cynthia Grady presents a difficult subject with honesty and hope. Cynthia Grady is a former middle-school librarian and the author of Like a Bird: The Art of the American Slave Song (Millbrook) and I Lay My Stitches Down: Poems of American Slavery (Eerdmans Books for Young Readers). She holds master's degrees in children's literature, library studies, and classics/philosophy/liberal studies. Amiko Hirao earned a degree in art history in her native Japan and later graduated from Rhode Island School of Design. She has illustrated Take Me Out to the Ball Game, Tulip at Bat (Hachette), and Just What Mama Needs (HMH). Young Katherine Tasaki tells Miss Breed, her librarian, that she and her family will be leaving San Diego soon. Aware of the new wartime law relocating Japanese Americans to remote prison camps, Miss Breed hands the girl a self-addressed, stamped postcard and asks her to write. At the train station, she hugs the departing children and gives them books and postcards. Later, she sends letters as well as boxes of books, seeds, soap, and craft supplies. She writes magazine articles about the treatment of Japanese American families, and letters requesting a library and school for the children. And when the war ends, she welcomes Katherine and other children home. This quiet, moving story tells of a young woman doing what she can to alleviate the suffering of Japanese American families wrongfully denied their civil liberties during WWII. Avoiding euphemisms about relocation and internment, Grady refers to “prison camp” and “imprisoned children.” The personal story, though, is full of warmth emanating from Hirao’s radiant, softly shaded color-pencil artwork, from Miss Breed’s relationship with the children, and from the actual quotes from their notes, appearing on small postcards superimposed on the illustrations. A beautiful picture book for sharing and discussing with older children as well as the primary audience. Against the grim backdrop of the Japanese-American internment camps, white librarian Clara Breed's compassion offered children a ray of hope and a comforting connection to the normal lives they sorely missed. The children's librarian at a San Diego public library, Breed had a close bond with many of her young patrons. Following the bombing of Pearl Harbor in December 1941, as these young Japanese-Americans were incarcerated with their families in harsh desert conditions, Breed corresponded with many of them, sending books and art supplies, and wrote articles and letters agitating for justice for the internees. Many pages include quotes from the children's correspondence, now archived at the Japanese American National Museum, which testify to the power of literature to make life more bearable. The text softens the harsh realities of the times, focusing primarily on Breed as a benefactor. "The US government" is named as the enemy, with the pervasive racism and overt hostility of many ordinary Americans going unmentioned. Following the war, readers are told that some Japanese-Americans "feared that they would not be welcome in their old neighborhoods….But others…couldn't wait to come home," even though the fears of the former were often justified and they might well have preferred to return home too. The endpapers feature historical photographs, and the colored-pencil illustrations give a gentle, sepia-toned feel to the book. Extensive endnotes provide valuable context. A touching tribute to a woman who deserves recognition, but it's one that should be complemented by other works. Grady (I Lay My Stitches Down: Poems of American Slavery) recounts, in partial epistolary format, the true story of San Diego children’s librarian Clara Breed, who corresponded with her young Japanese-American patrons while they were interned during WWII. Excerpts from the children’s letters appear as small signed postcards that overlay many of Hirao’s muted colored-pencil illustrations. “Books make the day shorter and happier for us,” one postcard declares; others offer upsetting glimpses into camp life (“We live in a horse stable”). Miss Breed also brought books and small gifts to the children at their Arizona internment camp and advocated in other ways (“She wrote magazine articles. She wrote letters asking for a library and school for the imprisoned children”). Endpapers featuring captioned b&w photographs from that era—one shows Japanese-American children awaiting deportation—cement the story’s context for young readers. This affecting introduction to a distressing chapter in U.S. history and a brave librarian who inspired hope concludes with extensive back matter, including an author’s note, a timeline of Breed’s life, and a selected history of Japanese-Americans in the U.S.